Researchers at the University of Southampton have identified an experimental drug that could be five times more effective than current treatments for certain patients with non-Hodgkin’s lymphoma, a common blood cancer. Non-Hodgkin’s lymphoma is the sixth most common cancer in the UK. Drugs called ‘monoclonal antibodies’ have revolutionised treatment for blood cancers in recent years and one of these drugs, Rituximab, has become one of the standard treatments for non-Hodgkin’s lymphoma. Unfortunately, a significant percentage of patients are unresponsive to Rituximab or go on to develop resistance to the drug. To overcome this, there have been a number of attempts to develop alternative monoclonal antibodies for use in the treatment of lymphoma. 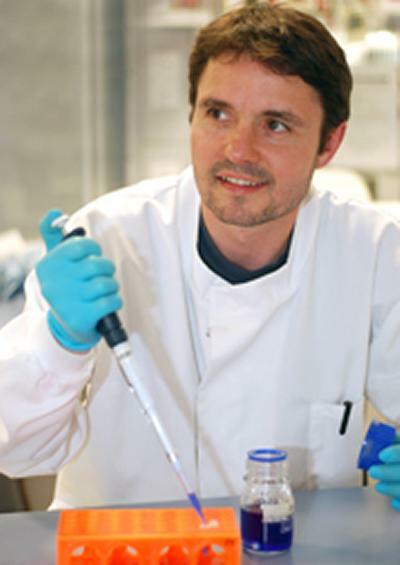 Dr Mark Cragg and his team at the University of Southampton School of Medicine have demonstrated in the laboratory that a new ‘type II’ monoclonal antibody is five times more effective at killing lymphoma cells than current ‘type I’ drugs such as Rituximab. Their results are published online in the prestigious medical journal Blood. Monoclonal antibody drugs work by seeking out and attaching themselves to a specific protein found only on the surface of cancer cells. The cancer cells are then ‘flagged’ and can be sought out and destroyed. The researchers found that the new ‘type II’ monoclonal antibody is so much more effective at destroying lymphoma cells than Rituximab because of the different ways that the two drugs react with the protein on the surface of the cancer cell. The paper is published online in March 2010 in the journal Blood under the title. ‘Antigenic modulation limits the efficacy of anti-CD20 antibodies: implications for antibody selection’. The principle author is Mark Cragg of the Tenovus Laboratory, Cancer Sciences Division, University of Southampton, School of Medicine.